While the summer months involve the best weather of the year for some of us, the weather may be more volatile and a source of tremendous stress for others. For example, depending on where you live, summertime might bring an increased risk of tornados or hurricanes. While preparing for an emergency is not really something most of us want to think about, it is always better to be safe than sorry. 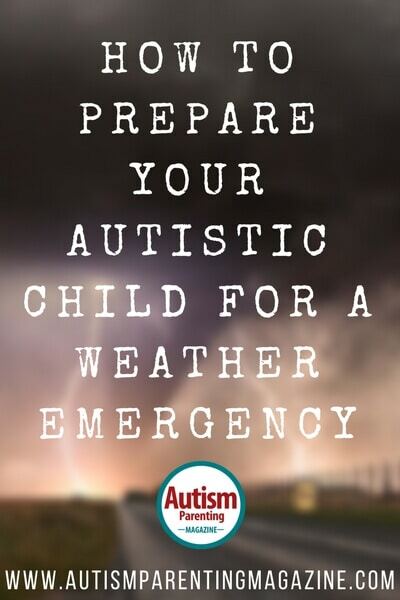 This article explains how to prepare your child with autism for the worst-case scenario when it comes to hazardous weather and emergencies. This means connecting with your community directly or accessing local media regarding the types of potential weather emergencies common to your unique geographic location. It is often possible to predict an impending weather front, and knowing when it is coming is the first step in being prepared for it. Depending on where you live, there are resources that can help you do this. For example, if you live in the United Kingdom, you may want to check out redcross.org.uk, whereas if you live in the United States, you can check out redcross.org for tips on emergency preparedness and regional/national weather-related emergencies. This is equally important if you are visiting another area. Knowledge is definitely power—or empowering, in this instance. Before you teach any skills that are pertinent to the type of emergency you may encounter (e.g., hurricane vs. tornado), it is a good idea to ensure that your child with autism is easily identifiable and able to get help when needed. This step will be very unique to each and every child. For example, a child with autism who is unable to answer questions about where he/she lives could exchange a card with identifiable information on it. There are all kinds of resources that a parent can access, ranging from free safety card templates to QR code technology. Whether you are going to be responding to a tornado or a hurricane requires some very different skills, but knowing what you are potentially contending with will impact what you teach. For example, you may need to teach your child with autism to go to the basement (if there is one) and wait, or, in contrast, you may need to teach the child to leave the building and get to higher ground. Knowing what you might contend with will affect the exact plan that is developed. These steps would change depending on your unique situation (e.g., if you have a basement or not). Once you have determined the steps, then you can teach them. This would begin with a little description about the steps. Then, you would show your child with autism the steps and have him/her practice. The research is very clear on this point: many children with autism will need to practice the steps themselves. It is simply never enough to just tell them. 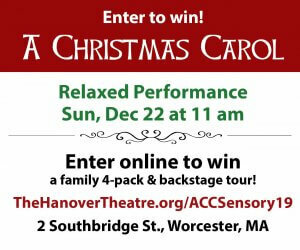 This way, you can give very specific feedback on the parts that were done well and on any parts that might need additional practice. For more tips on what to teach depending on the type of emergency, check out redcross.org. Opportunities to discuss with those involved and practice the plan. As with the safety skill above, the entire plan should also be rehearsed to make sure everyone is clear on his/her role and confident in his/her ability to carry it out. 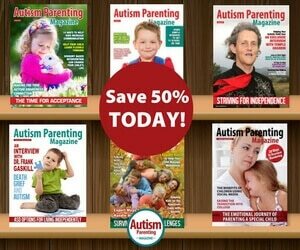 Well, I hope that you found this useful, and I would love to hear your thoughts on the Autism Parenting Magazine Facebook page! 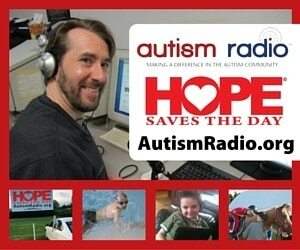 Keeping kids with autism safe is what it is all about! Sarah Kupferschmidt realized that Behavior Analysis was her calling when she first started working with children with autism in 1999. Once she discovered its effectiveness and the impact it had in helping children with autism and their families, it inspired her to pursue a Masters of Arts in Psychology with a specialization in Behavior Analysis from the University of Nevada, Reno. She is also a Board Certified Behavior Analyst (BCBA). Not only does Sarah enjoy working directly with children with autism, but she’s also very passionate about empowering others with the most effective tools to teach children with autism. She has been training staff and clinicians and coaching parents on how to do this since she started. She is also passionate about the science and research behind the tools that she advocates. In partnership with Brock University, Sarah is currently involved in a research project that involves the evaluation of a parent-training package that will help empower parents with tools to teach their children with autism important safety skills. 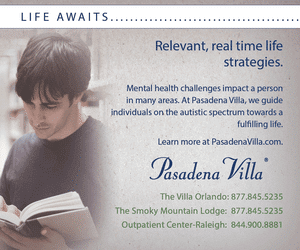 She has been a part-time or Adjunct Professor since 2005, teaching ABA courses. Sarah also regularly presents workshops to parents, therapists, and educators on a variety of topics related to teaching or working with individuals with autism. Sarah is a Huffington Post Contributor, a TEDx speaker, and was named Top Safety Contributor for Autism Parenting Magazine in 2014 and Top Behavior Analysis Writer for 2015.